Saying goodbye to infants and toddlers you have fostered is heartbreaking. Sometimes it’s hard to say goodbye to children even when they’ve never been placed in your home. After Melissa and Jonathan Elliott completed their certification to foster young children with Angels Foster Family Network, they got a call that seemed to be divine intervention. The couple had always talked about how much they wanted twins – a boy and a girl. It was something they had each wished for long before they met. 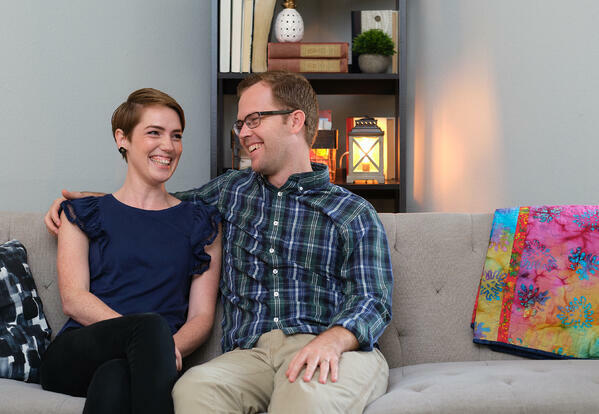 "Then we got a call asking if we could take a girl and boy set of twins, and I was like, Those are my babies!” says Melissa as she sits next to Jonathan in their sunny living room in Rancho Bernardo. As it turned out, the couple was soon told that the twin babies no longer needed to be placed in their care. “We were devastated,” Melissa says. They were heartbroken and grieving the loss of the babies when they got another call, this time for a one-month-old boy they call “J” who has been with them for a year. Although the experience with the twins was painful, it helped Melissa and Jonathan prepare their families for J’s future reunification. After a few months, Jonathan’s parents started referring to J as their grandson, and his sisters began calling him their nephew and talking about how they couldn’t wait to teach J how to ride a bike. “We don’t know if he’ll be with us next week,” Jonathan said. “It’s worth the heartbreak for us, but they didn’t sign up for that, so we just need to gently remind people that we’re fostering,” adds Melissa. The couple says they have to educate a lot of people about fostering, including strangers who approach them and urge them to adopt J. “Some people see fostering as a stepping stone to adoption, and they think we’re trying out a child and deciding whether or not to adopt him," explains Jonathan. "And people try to convince us to adopt him." Melissa jumps in, "Which is the most ridiculous thing because of course, we would adopt him – he's the best baby in the world! But it's not up to us."